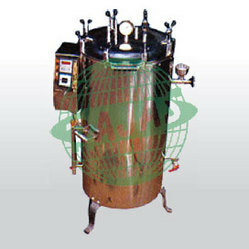 With long years of industry experience, we offer to our clients a wide range of Sterilizers. The broad spectrum includes Horizontal Rectangular High Pressure Steam Sterilizer, Horizontal Cylindrical Sterilizer, Vertical Sterilizer and many more. Also known as Autoclaves, these appliances are used to clean microbial, chemical and physical contamination from the laboratory apparatus. Our range is appreciated for the properties like precision performance, sturdy construction and easy to install. The types of laboratory apparatus sterilized by the sterilizer are Jars, beakers, bottles, stethoscopes, pipes and many more. 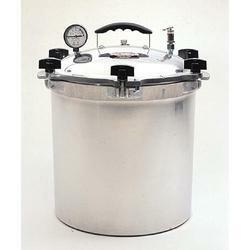 The Stainless Steel Single Drum Portable Autoclave is highly efficient apparatus which is designed to meet the requirements of small dispensaries, nursing homes, laboratories, medical missions, clinics, ships, Operation theaters, Pharmaceuticals etc. It is very simple to operate and economical to use. 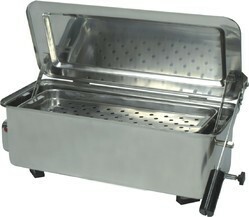 The container is seamless made of thick stainless steel provided with safety valve, pressure gauge for the pressure inside the unit, steam releasing valve, electric heater running on 220V, 50Hz, bakelite handle to carry the unit, , unit based on heavy metal three leg stand, supplies with power cable and one spare gasket and one spare heating element. 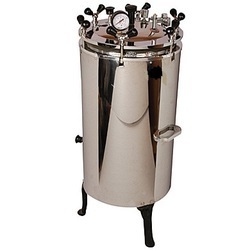 The portable single drum autoclave is highly efficient apparatus which is designed to meet the requirements of small dispensaries, nursing homes, laboratories, medical missions, clinics, ships, operation theaters, pharmaceuticals etc. It is very simple to operate and economical to use. 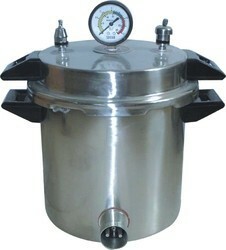 The container is seamless made of thick aluminum provided with safety valve, pressure gauge for the pressure inside the unit, steam releasing valve, electric heater running on 220v, 50hz, bakelite handle to carry the unit, , unit based on heavy metal three leg stand, supplies with power cable and one spare gasket and one spare heating element. Lid made of heavy duty gun metal single piece, unit run on power 220V double safety valves to ensure the safety of the user and the pressure gauge on the top of the lid, whistle, safety valve also provided on the top of the lid, gasket placed well between the lid and the unit water Level Indicator to show the level of the water inside the unit, release wave of the steam while the cycle complete, water changing tap, water input funnel and two metal handle to hold the unit while movement, accessories; Heavy duty Power lead, two spare element, two spare gasket. Rajas Autoclave Non Electric stove driven made of full stainless steel and with heavy gun metal lid , the portable autoclave used for the place where electric supply is not available, one pressure gauge, one safety whistle , one safety valve, wing nuts to lock the lid, handle provided to carry the lid, best of it's class total portable available in different sizes as per customer requirements. Having complete body of stainless steel of grade SS 304. It have pre vacuum cycle to remove air from the chamber. Water tank inbuilt with automatic water level sensors. It add water in the chamber automatically. It have automatic pressure door locking system when sterilization under pressure is in progress, to prevent accidental door opening. Automatic process termination in case, door is opened accidentally. It have dry cycle with selectable time period. Audio visual alarm to indicate end of process. Compatible sterilization tray be given with the autoclave. Visual indicator provided by Red LED to indicate process status. Safety valve to release excess pressure to prevent accident. Alpha numeric display to set the protocol with soft keypad. A product of choice in the medical field. Seamless shell & lever operated Lid fitted with full proof mechanism control excessive steam escape and restricts condensate within the shell. Incredible synchronized maneuverability of lid, due to statistically perforated tray for flushing & entry of water. Highly adoptable of your growing needs. Configuration design & material as per IS : 5022 Our medical sterilizer, hospital sterilizer available in different sizes: 510 x 200 x 150 mm, 430 x 200 x 150 mm, 300 x 150 x 125 mm. Heating with electric element. Flawless in concept, design & finish. Lid snaps fot on the body. Belt fits snugly and uniformly on the body thanks to precision clip which keeps the belt in fair tension. Belt slots and perforations of the body correspond accurately. Custom designed chains for comfortable latching. Configuration, design & material confirms is : 3831 in all sizes. Sizes : 350 x 240mm, 275 x 240mm, 275 x 132mm, 225 x 225mm, 350 x 130mm. 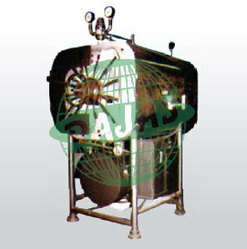 We are among the renowned manufacturers and suppliers of Horizontal Rectangular High Pressure Steam Sterilizer (Item Code: S.T.R-01). 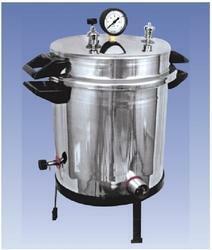 This is a triple walled autoclave used to sterilize the medical and testing equipment at specific temperature. Our high pressure steam sterilizers are highly effective in cleaning hospital appliances from the infectious organisms and chemicals. The entire array is made of premium grades raw materials supplied to us by the prominent vendors of the industry. We supply our comprehensive array at affordable rates. Sterilizer has inner and outer wall made of 304 grade stainless steel, middle jacket made of stainless steel or brass and gun metal. 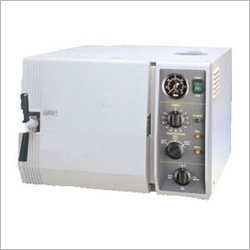 240 volts single phase, AC supply, 50 Hz. One spare element, and two gasket , our Regular sizes are 900X500, and 1050X750. Other sizes also available on request. Backed by the rich industry experience, we offer to our valued clients Vertical Sterilizer (Item Code: S.T.R-03). Sterilizer is an appliance to sterilize or clean the surfaces of the medical appliances from the bacteria, chemical deposits or dust particles. This appliance cleans the hospital and testing tools using high pressure steam. A sterilizer cleans testing jars, bottles, beakers, surgical instruments and hospital utensils from impurities and contaminations. We fabricate our entire gamut with quality approved materials.